This painting has sold! Thank you, doc.fb! Click here to view the bidding. 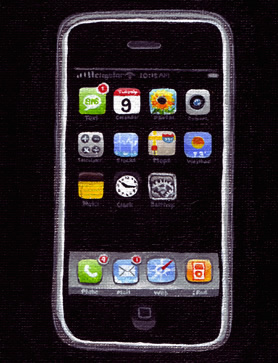 You can't get a real iPhone yet, but you can get this painting of an iPhone! 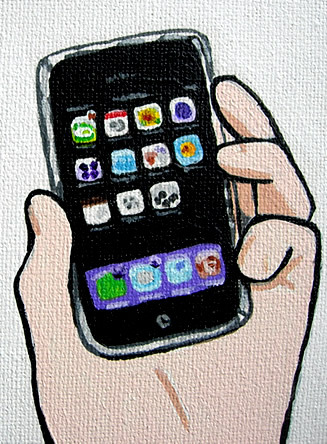 "iPhone" is the 23rd painting of my Painting A Day Blog. I painted it life-size, on a black background. I paid meticulous attention to the fine detailing of those teeny tiny icons. The iPhone is a superb subject to have painted. It's colourful, playful, a real techno-beauty! It's going to look gorgeous on a lucky geek's wall. This painting is on 7" x 9" canvas panel, and I used acrylic paints. If the painting isn't sold at auction, it will be up for sale at a higher than originally listed price, so it does pays to bid on the auction! Best of luck to all bidders! Be sure to check out the Joy of Tech, created by Snaggy and I, it's free and three times a week, see you there! This painting was sold at a very exciting auction... thanks to all who bid, and to the winner, pdantic! Announcing my 22nd painting of my Painting A Day Blog! 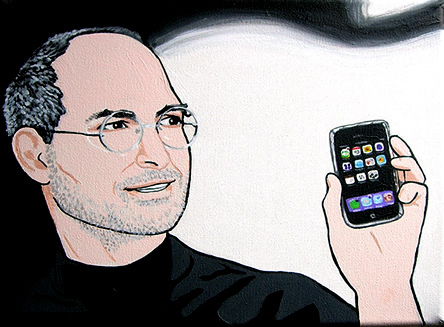 Your eyes are not deceiving you, this painting is of the mighty Steve Jobs holding up the freshly revealed iPhone! It is an occasion deserving of immortalization, so that's what I did, with paint on canvas. 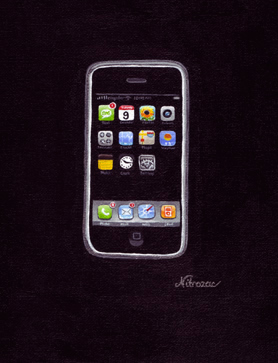 :-D This painting is filled with that goose-bump moment when Jobs unleashed the iPhone at MacWorld Expo 2007. Deep down you know the iPhone is going to be as big. This painting encapulates that techno-moment in history, and now it can be yours to grace your walls and feast your eyes upon. The painting is on a 7"x 9" stretched canvas. It has a substantial edge and raises the standard of quality of my paintings. A stretched canvas painting can be hung without a frame, which is a convenient option. Best of luck to all the bidders! If the painting isn't sold at auction, it will be up for sale at a higher than originally listed price, so it does pays to bid on the auction! Thank you!